Austin Beck knew his swing had too much movement. So what did he do? This story can be found on the SB Nation Oakland Athletics site, Athletics Nation. The Athletics have selected two supremely talented outfielders in each of the last two First-Year Player Drafts. Eric Kubota (Director of Scouting) and other A’s decision makers bet on Kyler Murray a few weeks ago and North Carolina high schooler, Austin Beck, in 2017. Every team says their selected talent possesses characteristics unique to each draft. However, with the A’s two most recent first-rounders, the inherent risk in both picks shows consistent application of a high-risk, high-reward philosophy. Murray is a two-sport athlete whose upside the A’s have continually said they value higher than the risk assumed by playing football in 2018. When asked about Beck in an interview with NBC Bay Area’s Joe Stiglich after the draft, Kubota focused more on Beck’s talent than circumstantial risk, saying, “You just don’t see a guy with that kind of bat speed he’s got.” Leading thinkers on the draft, like Baseball America, supplied the chatter around Beck’s risk, citing his unseasoned high school bat and ACL tear in 2016. In 41 games in the AZL Rookie League with the A’s to close out his 2017 season, Beck showed the rawness of his talent. He paired seven stolen bases and 13 extra-base hits with a near-30-percent strikeout rate and a .211 average. It surely wasn’t what Beck or any player would want in their debut, but struggle can be a unique to motivator for players. 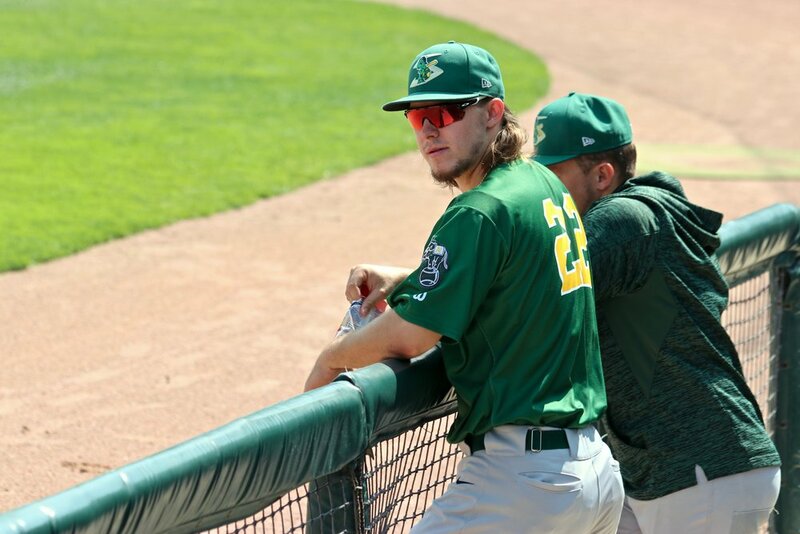 Beck’s strikeout rate has fallen six percentage points through 64 games with the Beloit Snappers of the Midwest League. He has boosted his average nearly 90 points in his first taste of full-season ball and received a bid to the Midwest League All-Star Game in Lansing, MI. On top of Beck’s refined discipline, his development also has roots in noticeable mechanical tweaks from his swing in high school. The video above shows two key differences in Beck’s swing. First is a general quieting of his hands. Keeping an eye on the tip of Beck’s barrel in each of the two videos above shows how much less activity there is as he maneuvers his bat into the hitting zone. Eliminating unnecessary moving parts can help to consolidate a hitter’s approach, foster a greater chance of repeating mechanics, and establishing the use of consistent timing mechanisms pitch to pitch. On a recent episode of Effectively Wild, former A’s first baseman Nate Freiman mentioned how essential timing is to a hitter’s approach. As Freiman mentions, part of his own struggles came from the moving parts his swing contained. Beck — albeit much shorter in stature — understood this idea on a smaller scale and quieted down his upper body. Second is lowering the depth of his leg kick. Highlighted above with yellow circles, Beck now employs more of a stride than a true leg kick. Lowering the height of his knee allows Beck to control his weight better. If you tracked his center of gravity with the deeper leg kick (left) and his current stride (right), the latter would show a smaller amount of total motion back and toward the ball. This can lead to a more balanced approach at the plate instead of Beck struggling to halt the power driving out of his back leg in a case where he commits to a breaking ball too early in its flight. An interesting consequence of this shortened stride, however, might be the slight dip in Beck’s power. This could be due to numerous factors removed from his mechanical changes (BABIP, league, etc. ), but a drop in his isolated power by over 60 points suggests an inordinate amount of his hits are merely singles compared even to his modest production in the AZL last season. Kubota praised Beck’s bat speed as one of the key factors that drove the decision to draft the 6-foot-1 outfielder (at least publicly). Fangraphs currently gives Beck a 60-grade raw power rating with a 50-grade game power rating. This suggests he’ll have average pop at the peak of his career arc, but Kubota’s praise from one year ago suggests the A’s might be anticipating more of Beck’s inherent raw power to actualize in-game. Could the door be open for further adjustment for Beck under the tutelage of the A’s player development department as he makes his way to Stockton, Midland, and Nashville? Absolutely. How the A’s suggest he makes adjustments in the future (they could revert back to a higher leg kick once Beck’s pitch recognition improves naturally with reps) will signal whether they still see the hidden power they likely expected on draft day with Beck’s exceptional bat speed. Beck knew he needed to adjust and executed on his plan. Once Murray enters the A’s farm system, I wouldn’t be surprised to see a similar consolidation of approach as the two-way athlete adjusts to advanced pitching and amasses reps against better breaking balls than he has seen even in a strong college conference. If the latter of the high-risk, high-reward model comes to fruition, the duo of outfielders will continue to adjust even more. At that point, one can hope it’s in the same major league outfield.